Ok. So, we all know what time of the year it is, right? Well, besides Hurricane Season....it's Summer Festvial Season, y'all! Annnd, less than one week from today, we're kickin' it up a notch like Emeril for Essence Music Festival weekend in Naw'lins! Well, Gulf Coast Naturals wanted to bring an annual event catering to natural hair, beauty & lifestyle community during the festive weekend. So, after much debate with my pessimistic bff (good ol' fashioned self-doubt), I decided to tune her out and just go for it. So, Fierce.Fly.Fabulous 2011 was born! It was a successful first year event, thanks in part to the fabulous Felicia M. Leatherwood (Celebrity Natural Stylist to the likes of Jill Scott, Will Smith, Tomiko Fraser, etc.) and her highly-popular Loving Your Hair with Natural Care workshop. 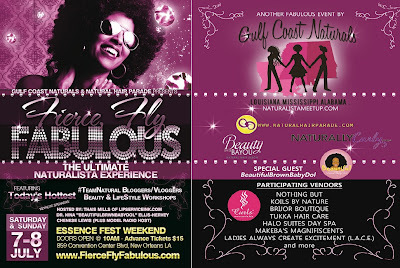 A great time was had and we knew that GCN would definitely plan for a naturalista takeover of Essence Weekend 2012. And now, with the natural movement gaining more and more mainstream attention, this year's Essence Weekend has several beauty events that will cater to the naturalistas for what is sure to be a Naturalista Takeover, indeed! It all kicks off with our favorite CFF (curlfriend for life...in our head, at least), CurlyNikki! 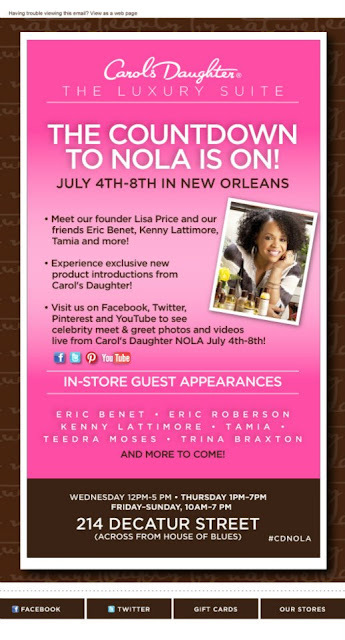 The diva is known to throw her infamous CurlyNikki Does..." Meetups and it's finally New Orleans and the Gulf Coast's turn! I am too friggin' excited! I've been getting my Jessie Spano "I'm sooo excited..." on since Nikki's teaser post two weeks ago. Peep the clip below! 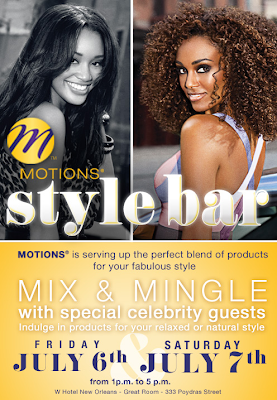 African Pride is returning & Motions is joining in on the fun w/ hair & beauty events that begin on Friday and run for multiple days over the weekend. 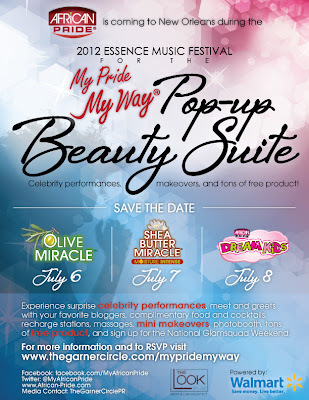 Click on the respective flyer for all the deets and to RSVP for either Pop-Up Beauty event! Carol's Daughter is also returning with her Annual Pop-Up Boutique w/ Celebrity Appearances and Meet & Greet opportunities for those who make a purchase of $35 or more.